Hot chocolate! I'm trying to turn that phrase into an exclamation, as in "Hot Chocolate! Did you see that guy vault that line of six Doberman Pinschers? Marshmallowerific!" Okay, maybe it still needs some work. It's the time of the year when the weather is starting to turn nippy. Okay, it should be starting to get nippy. Of course, it's been in the sixties the last few days here in New England. If it were on the chilly side, I'd say that it's the perfect time for some hot chocolate. 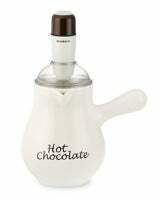 And if you're tired of just pouring hot water over that packet of dry Nestlé cocoa mix, Williams Sonoma has got your back with their Hot Chocolate Pot. Heat up some milk in the microwave and add it into the pot with chocolate shavings, chocolate chips, chocolate syrup, or what have you, and the Hot Chocolate Pot will froth it into a delicious concoction. It'll take 2 AA batteries, but it's dishwasher safe and just $30. Hot chocolate!